When these flies were first developed they became deadly. The first Klinkhammers were found to lift trout when they were not even rising due to their unique profile and shape. These flies are still deadly and used world-wide with incredible effect. We found however that dark posts were good in light conditions but became poor during the evening as light changed, that was when we decided to develop the hi-visibility klinkhammer range. With 50% luminous yellow and 50% black posts these klinkhammers can be used and any time of day in any light conditions and are especially useful as dusk comes and the light conditions are changing, for those late night trout!. Small hook sizes especially pleasing. I haven't tried them yet but they are very well tied and extremely attractive. Hope the trout find them that way! 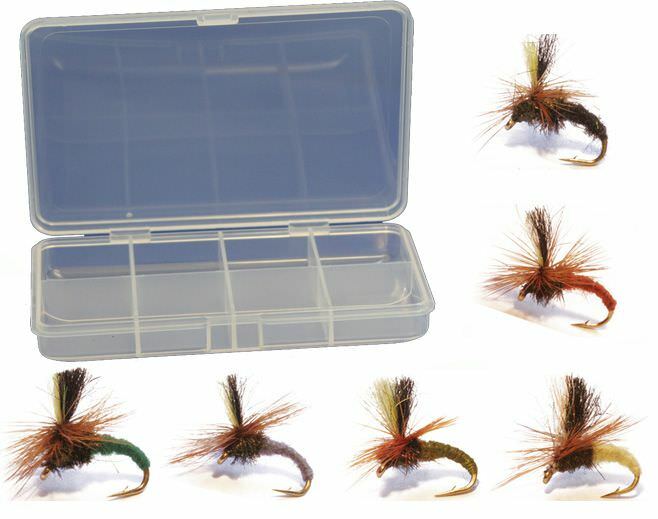 Just received this flies, tied beautifully, very fast delivery and will defiantly be purchase from here in the future. Found it difficult to order the web site keep refusing payment. Tried these the day I got them I would like to say I caught a fish on the first cast but unfortunatley it was on the second, third and fourth. I find them much easier to see in the the half light than the normal white or black and the fish can obviously see them. 3lb rainbow on second cast with the 1st klink I tried! Need I say more? I ordered several items at the beginning of the Whit bank holiday, the first time I have used Essential Fly. I received everything I ordered by the following Wednesday. I will definitely be a reqular customer.